The northern province of Phu Tho has finished preparation for the Hung Kings Temple Festival, one of the biggest festival of the year, which will take place from April 21-25, or the 6th-10th day of the third lunar month, said a provincial official. 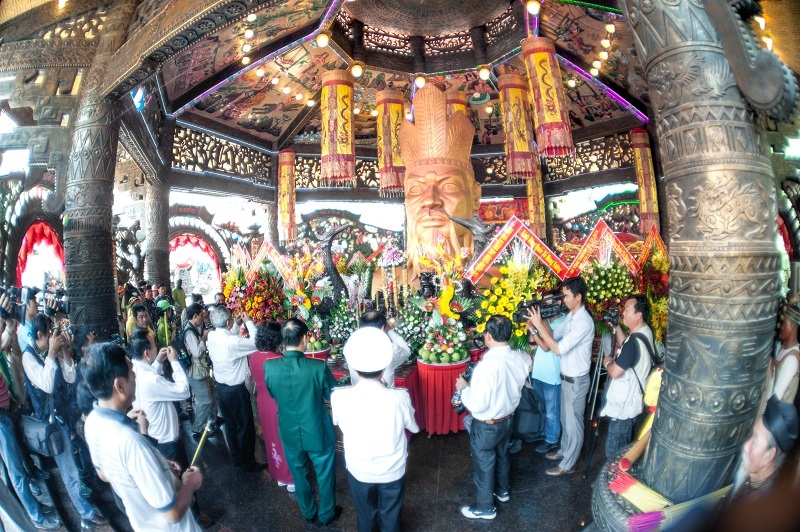 According to Vice Chairman of the provincial People’s Committee Ha Ke San, who is also leader of the organising committee, the festival will be hosted by Phu Tho at the Hung Temple Complex in Viet Tri city and surrounding communes while four other provinces including Thai Nguyen, Quang Nam, Binh Duong and Kien Giang will support its organisation. This year, the province will continue making efforts to popolarise Xoan singing and Hung Kings worshipping rituals, which were recognised by UNESCO as intangible cultural heritage of humanity, he noted. To prepare for the event, the organising committee has been set up with sub-committees and inter-sector inspection teams responsible for monitoring and examining the preparation and businesses in the festival’s areas, he said. Holy places and stairs leading to the Hung Temple Complex have been repaired and renovated while tour guides will be arranged to instruct tourists how to practice rituals, according to the complex’s director Nguyen Duy Anh. The complex’s management board will work to ensure visitors’ safety, he added. A series of exciting festive activities will be held during the five-day festival, including a book fair, “chung” (square cake) making contest, exhibition, cultural camp, art performances and particularly Xoan singing. The annual festival takes place on the death anniversary of the Hung Kings, founders of the nation, to pay tribute to the Vietnamese ancestors. Vietnamese legend has it that Lac Long Quan, son of Kinh Duong Vuong, married Au Co, daughter of King De Lai. Au Co gave birth to a sack containing 100 eggs from which 100 children were born. The couple then decided to separate to populate the land, so half of the children followed their mother to the highlands and the rest went with their father to the sea. The first child went with mother Au Co to Phong Chau, now Phu Tho province. He then became King Hung and founded the first nation in the history of Viet Nam, Van Lang. Ruling the country for 18 generations, the Hung Kings taught the people how to grow wet rice. They chose Nghia Linh Mountain, the highest in the region, to perform rituals devoted to rice and sun deities to pray for lush crops. To honour the Hung Kings, a complex of temples dedicated to them was built on Nghia Linh Mountain, and the tenth day of the third lunar month serves as their anniversary. The worshipping rituals of the Hung Kings are closely related to the ancestral worship traditions of most Vietnamese families, an important part of people’s spiritual lives. The worshipping ritual of the Hung Kings was recognised as UNESCO Intangible Cultural Heritage of Humanity in 2012.